Janet Nkubana, the co-founder of Rwanda-based Gahaya Links, will be one of four speakers at the upcoming European Development Days conference, November 26–27. She will be part of a DAI-sponsored innovation lab addressing women’s economic empowerment called “Harnessing public private partnerships to connect women’s businesses to international supply chains.” This lab includes Alex Thier, the Assistant to the Administrator for Policy, Planning, and Learning at the U.S. Agency for International Development (USAID), and DAI’s Anne Simmons-Benton and Katja Silva-Leander. Gahaya Links’ story of how as a small business in Rwanda it has been able to reach the international marketplace with the assistance of a donor project is inspirational. Shortly after the genocide ended in 1994, Nkubana and her sister, Joy Ndungutse, founded Gahaya Links as a microenterprise that produced and sold traditional woven baskets. Product lines such as jewelry and other accessories were added later. Many of the women employed at Gahaya are survivors of the Rwandan genocide who had started weaving baskets in exchange for food. She trained them to use different designs and colors to appeal to a wider audience. Nkubana attended a trade show in 2006 funded by USAID. She received assistance from USAID in the form of marketing and business advice. Soon thereafter she attended an industry marketing event in New York and left with a contract from Macy’s. Connected with the right tools and assistance over the years, Gahaya Links has partnered with Macy’s, Walmart, Oprah Magazine, and Kate Spade. Gahaya has expanded to 52 cooperatives with 4,000 weavers from Rwanda. The weavers have been able to send their children to school, acquire medical coverage, and open bank accounts. The business fosters a spirit of solidarity among its workers, bringing together genocide survivors to work together for the first time. Gahaya Links’ success stems from the personal determination of the founders and the support they have received from development intermediaries who gave them the opportunity to connect with a domestic importer, said Melanie Beth Oliviero, Strategic Advisor to DAI. Gahaya Links has been able to leverage long-term relationships with members of DAI and a partner importer in NYC, Fantasia World. Both have not only assisted in product development, but introduced Gahaya Links to the necessary professional skills such as making deals, negotiating contracts, and adhering to corporate quality and sanitation guidelines. Together, Gahaya Links and the trade specialists have expanded the company’s inventory to include napkins, pillowcases, belts, jewelry, and bags. By understanding the market requirements and learning how to meet them, Gahaya Links won recognition from Walmart as a professional and high-quality small social enterprise. For the first time, the business negotiated a contract directly with a buyer. Nkubana also learned firsthand from Walmart’s staff buyer about how to market and redesign products to appeal to an American audience; for example, by finding smaller, lighter beads for bracelets that would better suit American women who work at computers all day. Gahaya Links’ story illustrates the value of technical assistance that connects small businesses to private brokers and domestic importers in the supply chain, said Simmons-Benton, DAI’s Trade and Gender Advisor. “It is the nexus between targeted donor support on the ground that links small businesses to the crucial knowledge of markets, the links to brokers, importers, and buyers that makes the difference in bridging the gap in the supply chain,” said Simmons-Benton. “Working with Gahaya Links is an example of how individual women can be game-changers for their communities and countries through donor assistance.” It is no surprise that the Government of Rwanda has bestowed several awards on Gahaya Links as the model of an entrepreneurial, tax-paying economic driver of post-Genocide Rwanda. 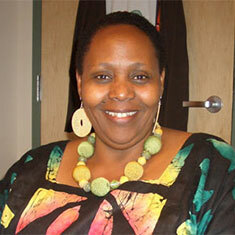 Meet Nkubana at EU Dev Days or follow #EDD13 on Twitter as we probe new innovations at the EU Dev Days Lab on Gender.